Since articular cartilage is subjected to varying loads in vivo and undergoes cyclic hydrostatic pressure during periods of loading, it is hypothesized that mimicking these in vivo conditions can enhance synthesis of important matrix components during cultivation in vitro. Thus, the influence of intermittent loading during redifferentiation of chondrocytes in alginate beads, and during cartilage formation was investigated. 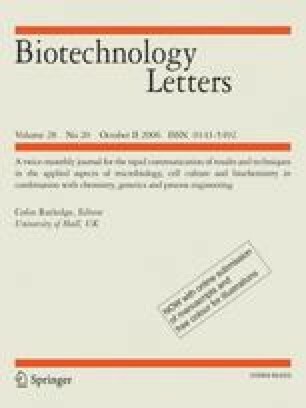 A statistically significant increased synthesis of glycosaminoglycan and collagen type II during redifferentiation of chondrocytes embedded in alginate beads, as well as an increase in glycosaminoglycan content of tissue-engineered cartilage, was found compared to control without load. Immunohistological staining indicated qualitatively a high expression of collagen type II for both cases. We would like to thank Ditte Siemesgelüss for here excellent technical support, Prof. Dr. Michael Morlock for is help in statistical analysis and␣Zellwerk GmbH, Eichstädt for donation of the ceramic carrier. The project was kindly supported by “Qualitätsoffensive Tissue Engineering”, Hamburg.